1 Put vegetables in sauce pan with 2 cups of water (300 ml). As water comes to boil cover the sauce pan. Lower the heat to a medium flame and cook for 4 to 5 minutes until vegetable are tender. 2 In a kadhai, heat oil, add cumin seed and allow it to splutter. 3 Add chopped onion and sauté well.for 30 seconds. 6 Add 1 tbsp. of Knorr Chef’s Royal Vegetable Masala, red chili powder, turmeric powder, coriander powder and salt to taste. 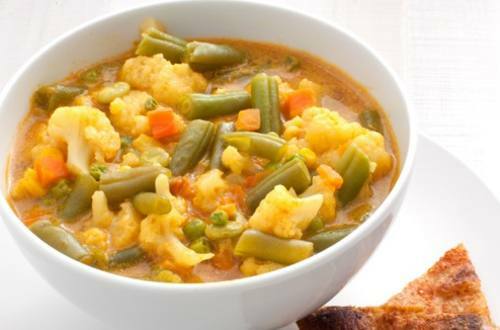 7 Now add all boiled vegetables along with 1 cup of water (150ml). 8 Put the lid on and allow it to simmer in low flame. 9 Garnish with chopped coriander. 10 Serve hot and enjoy.